Well its time for April American Physical Society meeting, so here I am in Denver, Colorado. After a cab ride from the airport, which was just about half as long as the airplane ride, it was time for dinner and time to check the news. It was pretty cold outside, but not snowing, even though there was a bit of snow still left in little clumps around, like in the planter boxes, etc., so the Yard House restaurant right inside the hotel made a perfect first night choice. Sadly, my Colorado Friend, Searching for Gravity Waves, Dr. Gary, could not attend this April meeting and I missed seeing him. Next time, Gary! There was still enough time to check the news . We also found an interesting article by astrophysicist, Janna Levin, "What the Sight of a Black Hole means for a Black Hole Physicist" in Quanta Magazine. In this article she talks about the process of discovery and how even after years of struggling to understand the mathematics of black holes as described by general relativity, and even though she understood what the resulting images should look like, but actually seeing the image was quite a moving experience. 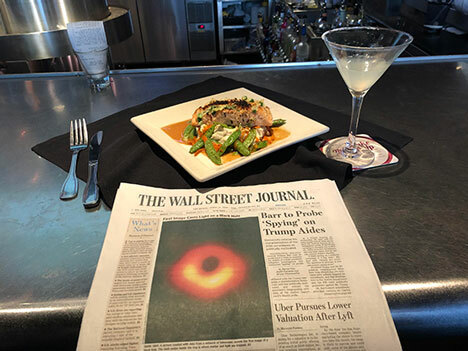 While attending the NSF press conference, she said " I am moved by the image of a species looking together at an image of a curious empty hole looming in space." Yes, it was a pretty neat achievement. 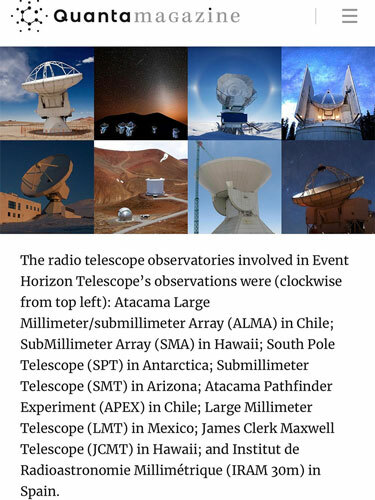 Her article also included the photos of the eight radio telescopes that make up the Event Horizon Telescope (EHT). Resident Astronomer Peggy and I have toured the submillimeter telescope (SMT) on Mt. Graham, in Arizona, but that means that there are still 7 more observatories to fit into our travel schedule! Ok, so the next morning it was time for the APS Workshop: New Ideas in the Search for Dark Matter. 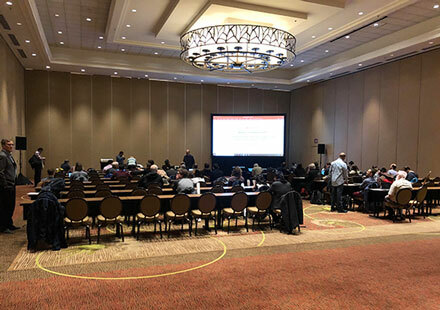 The April meeting officially starts the day after, but the workshop, which was almost like a tutorial, was a good overview of the ongoing and new proposed searches for dark matter. There were a lot of students present, including at least one "senior" student. So, I can only try and summarize one or two key ideas that were new to me. One topic that was quite interesting was the search for dark matter using antimatter in laboratory searches. 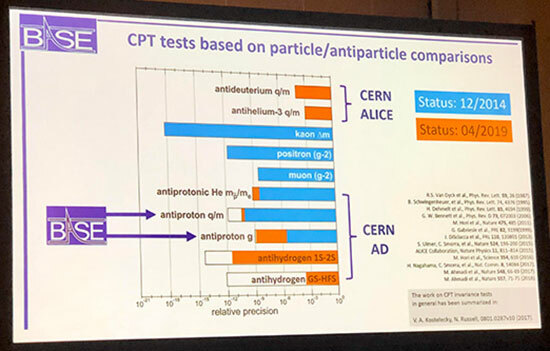 Chrisian Somorra discussed work ongoing at CERN where antimatter, primarily protons, but neutral atoms as well, are produced and the properties of antimatter can be compared with normal matter. In the slide below, you can see that some parameters, like the magnetic moment and charge to mass ratio, have been compared and no measurable difference between normal matter and antimatter, at least to the parts per billion. He also said that anti-protons have been generated and then sored for over a year in collection systems and then used and studied as desired. That is pretty neat and sounds just out of Star Trek! 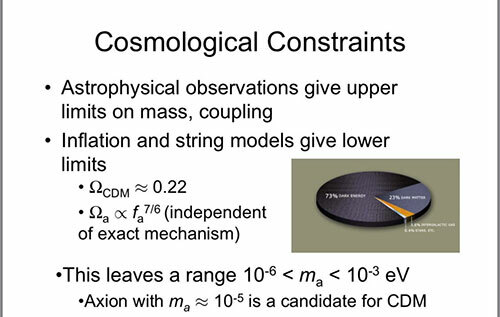 Another topic that was quite interesting was how cosmological constraints are used to pin down some of the expected, but totally unknown, characteristics of the dark matter. Whatever dark matter is, the amount of it must match the known measurements energy density of its gravitational effects on structure formation and CMB measurements. So, if the proposed dark particle is lightweight, like a axion, there must be aa vast number of them. If the particle is heavier weight, like a neutrino, or even heavier like a sterile neutrino, then there must be correspondingly fewer of them so the total mass density, mass time the number density, is a constant that matches the measured value. The mass range of these particles goes from the very small like the axion, which has mass of say anywhere between about a nano-electron volt, and even lower, to higher ranges of a milli-electron volt, while the neutrinos are say in the range of a few electron volts. There sterile neutrino can be heavier say in the ten thousands of electron volts. Then other cosmological observations put upper and lower bounds on the possible mass of the dark matter. In this slide below, taken from some of my external homework, you can see that astrophysical observations give upper limits and inflation models are used to give lower limits of the mass range. So constraints from both cosmology and from particle physics set the ranges of masses that the dark matter searches take place in. Now, since the axion is just a theoretical particle, invented as one possible way to fix some other puzzle in the standard model, you have to wonder how you can go about detecting it in the first place because no one really knows what it is. Well, using the standard model of particle physics one can identify possible ways it could interact with normal matter and these ways are used to structure some experiments. I heard that one of the key ways is through the Primakoff Effect, which is one way an axion type particle is said to interact with a magnetic field and a normal, observable photon. So axion laboratory searches, such as ADMX and Dark Matter Radio, all rely on using high magnetic fields in the laboratory. 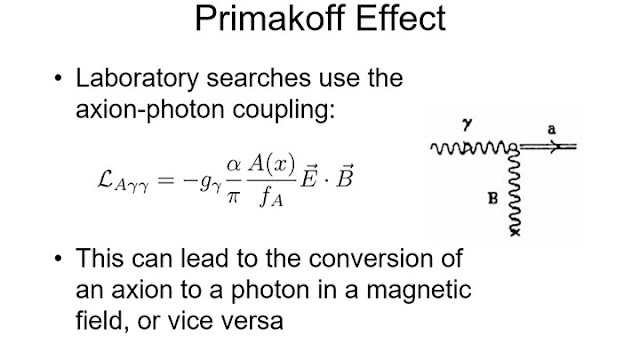 It turns out that the wavelength of the outgoing photon can be related to the Compton effect, where the wavelength associated with a particle is inversely related to its mass. So while the Compton wavelength of an electron is about 2.4 times 10 to the -12 meters, the Compton wavelength of the axion with the smallest expected mass can be meters to kilometers in length, which complicates the design of any detector capable of detecting the axion. But, it is not just in the laboratory where high magnetic fields can be found. 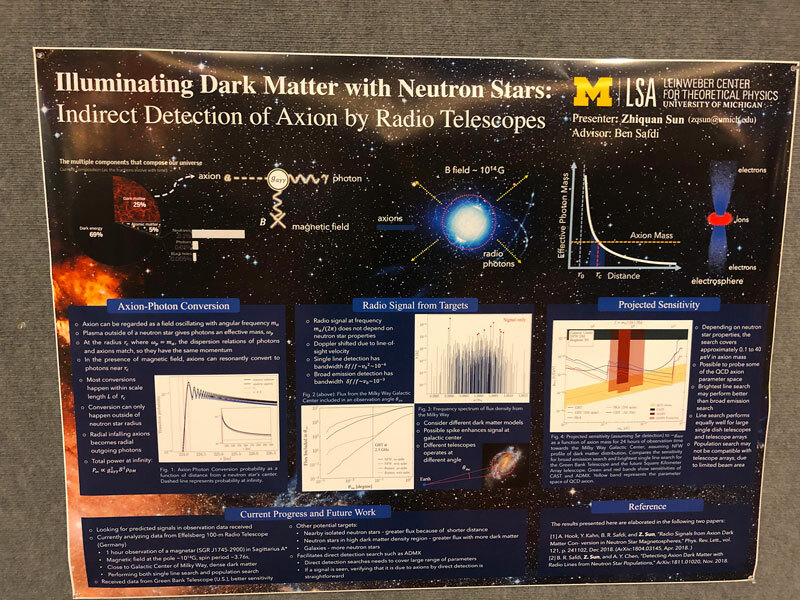 An interesting poster by Zhiquan Sun, "Illuminating Dark Matter with Neutron Stars: Indirect Detection of Axion by Radio Telescopes." So, since the detection probably goes up linearly with the strength of the magnetic field, the neutron stars filed is much, much larger than any laboratory magnetic field, so pointing a radio telescope at the environment around neutron stars might detect the predicted photons from the Primakoff Effect. Finally there were many other types of particles that were being considered as dark matter candidates that I can not offer any review of except for some brief comments. One example, Surjeet Rajendran, UC Berkeley, talked about detecting Dark Blobs, where the blobs are formed by some exotic dark matter particle that, because of gravitational or other form of attraction, glom together and make Dark Blobs. These blobs can be quite massive and yet their number density is low enough that the overall cosmological constraint is still met. It does mean that a detector for Dark Blobs has to be large enough to see enough blobs passing through it in order to be detectable. 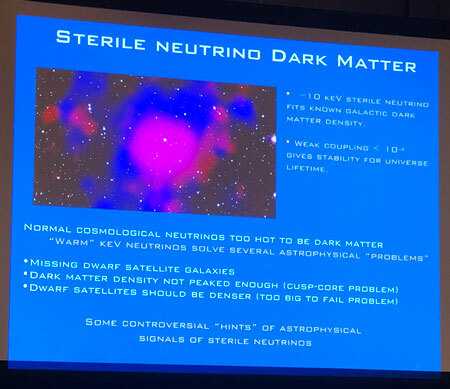 Another example put forward as a dark matter candidate is the sterile neutrino, as shown in the slide below from Eric Hudson, UCLA, who made a very spirited presentation. Remember that a sterile neutrino is sort of a heavier version of the three neutrino family, but it does not feel the weak force. So, sterile neutrinos are heavy enough that they would be non-relativistic and could contribute to structure formation. Even though they don't feel the weak force, they do interact with electromagnetism so they can still be detected.